Texas is the home of a tough breed of cattle, our Texas longhorns. 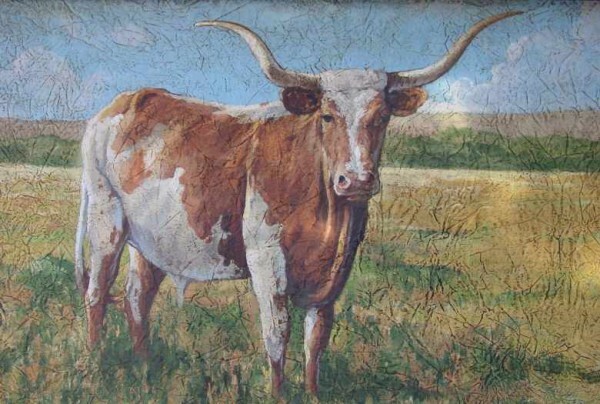 Come celebrate the best of our country’s past, present and future with fine Texas longhorn art paintings, pictures and prints of these amazing animals. What’s so special about Texas longhorns? Unlike many other breeds, they have adapted to the environment over a 500 year period to fit the Texas land and its climate. FYI, here’s a nice article about the Texas longhorn breed. These Texas art collection images from Texas artists celebrate our Texas longhorn heritage and add flair to your Texas home or office wall decor and show you are proud of Texas! For more details, click on any picture.